I hope you’ll join me and a host of lung cancer experts on Saturday, October 3, 2015 at the GRACE ALK, ROS1 & EGFR Acquired Resistance in Lung Cancer Patient Forum. I’m on the faculty, speaking about lung cancer patient survivorship. 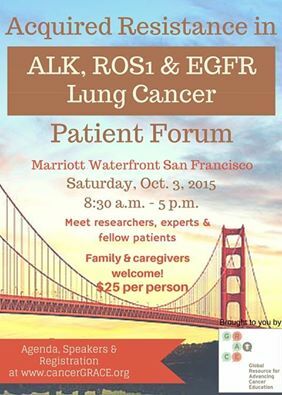 The forum is for ALK, ROS1 & EGFR lung cancer patients and their caregivers, and will be held at the Marriott Waterfront San Francisco. You can register and read the agenda (with a list of confirmed faculty) online. At the forum, lung cancer patients can learn about research advances in lung cancers driven by ALK, ROS1, and EGFR. You’ll hear from leaders in targeted therapy research. In addition to presentations and question and answer sessions, attendees will have many opportunities to approach the faculty to speak with them directly. An evening reception after the event will enable additional face time and give attendees – many of whom know each other from online support groups – a chance to meet in real life. Quality of Life vs Progression Free Survival – What Are the Most Relevant Endpoints? Registration is $25 per person. GRACE has negotiated a group rate for rooms at the Marriott Waterfront San Francisco of $179 per night (request the “GRACE Patient Forum” room rate). #LCSM Chat Topic 10/23: How can we help new stage IV #lungcancer patients consider 2nd opinions, mutation testing and clinical trials? 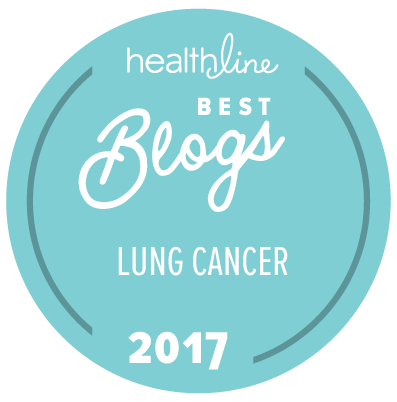 The following post is reblogged with permission from today’s #LCSM Chat blog. Most patients experience a period of stunned disbelief or shock when they hear a diagnosis of “metastatic lung cancer.” For those who are offered treatment options, the first few months revolve around medical appointments. Others may only be told to go home and get their affairs in order. Patients and family members may be in denial, or trying to process what all those dismal survival statistics mean for their future. It might be the first time the patient or a family member has had to confront the possibility of death for themselves or a loved one. Some patients (or their caregivers) may be empowered, engaged and researching options, but many don’t have the physical or emotional energy to do so. At this point, few patients are thinking about second opinions, mutation testing, or clinical trials. The problem with waiting for metastatic lung cancer patients to become empowered and engaged is that the majority won’t live a year if they can’t access the newest treatment options. However, if they get educated about their options, consult with a knowledgeable oncologist, and are eligible for newer treatments or clinical trials, their lifespan may be years longer. You might ask, how could this be true? The landscape of personalized medicine and new lung cancer treatments is changing fast, and more stage IV lung cancer patients are living longer. Unfortunately, due to the pace of that change, not all healthcare providers who treat lung cancer are current on the newest treatment options. Some oncologists do not test their patients’ adenocarcinoma lung cancer tumors for EGFR or ALK, even though NCCN and other respected guidelines recommend it. Even research oncologists at NCCN facilities can’t track every new clinical trial for lung cancer. And, sadly, some healthcare providers simply believe that because metastatic lung cancer is not curable, there’s no point in treating it. The fact is, most metastatic lung cancer patients (or their trusted caregivers) will need to become engaged and empowered if the patients want a better chance at survival. Many will need help to do this, either online or offline. T1: How can we help a stage IV lung cancer patient understand the need for 2nd opinion when their doctor offers no treatment? T2: How can we help a stage IV adeno lung cancer patient consider EGFR & ALK mutation testing if their doctor has not done it? T3: How can we help a stage IV lung cancer patient consider targeted therapy clinical trials if they have a targetable mutation? We look forward to seeing you in the chat! To participate in the chat, remember to include #LCSM in all your tweets, or use a tweetchat tool like tchat.io with that hashtag (more on that here).